Ben & Jerry's, founded by two drop-out hippies in Vermont in 1978, still manufactures 75% of it's ice cream in the state and we went along to their first ever factory in Waterbury today to have a look around and of course get a taste. Not suprisingly it was busy, but organised, and we walked the half-hour tour (cost $3 each) and ended up in a room originally used as the creative think-tank by Ben & Jerry to get a free taste of the companies latest product 'Chococow late'.... a nutty creamy vanilla flavour with whole mini chocolate cows mixed inside. Pretty tasty. The freebie was enough for us (we had already been to the cider mill, the chocolate shop and cheese creamery) and the queues to buy ice-cream were long and too many teenagers were sat around buckets of Chunky Monkey with spoons and eyes bigger than their bellies. 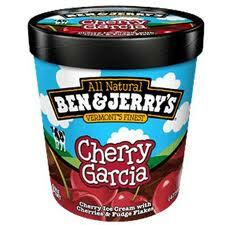 Ben & Jerry are almost 60 now and have little involvement in the company since it sold out to Unilever. Hopefully Ben and Jerry who spent $5 on an ice-cream maker in 1978 because it was cheaper than a bagel maker are enjoying their retirement in a hippy commune eating as much Cherry Garcia as they can.